Timothy C. Ward invited super-fan, Sarah Chorn, and the wonderful reviewer behind Bookworm Blues to interview Hugo Award winning author, Elizabeth Bear, who just recently finished her ETERNAL SKY trilogy. And the wonderful people at Tor are offering a giveaway of the entire trilogy to one winner with a mailing address in US or Canada. AISFP has added to the pool with a second winner getting their choice of any book in the trilogy as an ebook. Tim recently reviewed Range of Ghosts. What were some of the things she needed to have down before she started writing her stories? How the first line of Range of Ghosts (Eternal Sky, Book One) popped into her head and then she had to build her story around the ideas it proposed in order to make it work. What kinds of goods are traded on the Silk Road (question by Paul Weimer). Her Steampunk Western with Sewing Machine Mecas. How long it takes her to write a book. What she does to get the work done on days when writing is not what she wants to do. Expanding your reading horizon to different genders and nationalities. Tips to keeping your characters from being cliche. This was a great podcast. Thanks, Tim and Sarah! 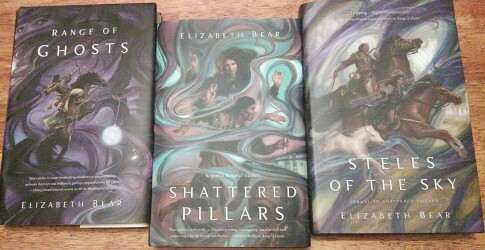 Elizabeth Bear’s work has been on my radar for a while, and I think her Eternal Sky series is just what this tired fantasy reader needs. Fans of this series ought to also check out K.V. Johansen’s silk road fantasy, Blackdog, which is a beautiful novel. Thanks Jordan! K.V.’s The Leopard comes out in June, and I’m hoping to get her on the show and review it (is that one you’d like?). Already got it and reading it.